This week, I am heading to the beautiful and historic city of Savannah, Georgia, to present about “Challenges and Successes in Teaching Evolution” at the Southeastern Evolutionary Perspectives Society Conference (SEEPS). The timing of this conference is no mistake. As science teachers and university researchers gather in Savannah, we do so on the weekend closest to Charles Darwin’s birthday on February 12. This year (2018) marks the 209th anniversary of Darwin’s birth (as well as Abraham Lincoln’s). As you can see, even the SEEPS logo reflects the famous “Tree of Life” sketch from Charles Darwin’s 1837 notebook. As Darwin Day 2018 drew closer, I found myself intrigued by the history of it, as well as wondering what people are doing this year to recognize Darwin’s birthday. As a teacher with an avid interest in things evolution-related, I have been aware of Darwin Day for many years, and always recognize it in class. Sadly, I confess, I had never dug deep to appreciate the range of things that are being done and the impact of evolutionary thought over the past 159 years (since On The Origin of Species was published). The history of “Darwin Day” goes back to the nineteenth century, when February 12 was sporadically celebrated after Darwin’s death in 1882. Those events were usually remembrances and were fundamentally hosted by members of Darwin’s extended family or fellow naturalists who knew him personally. 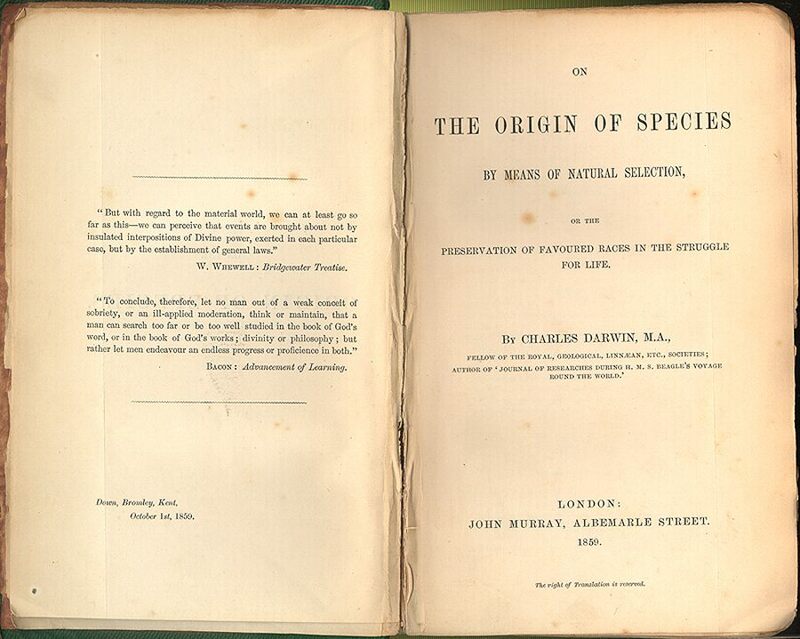 The first broader recognition of “Darwin Day” occurred in Cambridge, England, to celebrate the centennial of Darwin’s birth as well as the 50th anniversary of the publication of The Origin of Species. The gathering attracted more than 400 scientists from 167 nations to discuss the ongoing impact of Darwin’s array of work as well as new research related to the field of evolutionary biology. In the United States, the New York Academy of Sciences sponsored a birthday celebration at the American Museum of Natural History and unveiled a bust of Darwin that was touted by his surviving family members as the best sculpture of him made up to that point. After 1909, mention of Darwin birthday celebrations are sparse, but in November 1959 the University of Chicago organized the five-day Darwin Centennial Celebration, which celebrated the 100th anniversary of the publication of The Origin of Species as well as Darwin’s 150th birthday. This event centered around lectures and panel discussions of Darwin’s work as well as a book exhibit featuring prominent evolutionary titles. A documentary of the celebration was released in 1960 and John Scopes, the defendant of the famous 1925 “Scopes Monkey Trial” spoke at its premiere. Listen to Ernst Mayr and Julian Huxley speak at the Centennial Celebration in Chicago. Celebrations of Darwin remained sporadic after 1959, with various groups such as Salem State College in Massachusetts (1980) and The Humanist Community of Palo Alto, California, (1995) organizing regular ongoing Darwin events. A more widespread effort to celebrate what began to be called “Darwin Day” focused on the bicentennial of his birth in 2009. The 2009 Darwin Day celebrations were international in scope and revitalized the public in their appreciation of Darwin’s work as well as boosting understanding of how the science of evolutionary theory has grown. The wide-ranging nature of the 2009 celebrations—which were hosted by myriad universities, natural history museums, Humanist groups, and even religious groups—form the basis of many of our current Darwin Day events. Last week, I sent word to my network of evolution thinkers and teachers (My Evolutionary #HiveMind if you will) and here’s a taste of what they shared with me about their plans. Jonathan Tweet (@grandmotherfish), author of the highly acclaimed Grandmother Fish, will travel to Minneapolis-St. Paul, where he will be presenting a slate of kid-friendly Darwin Day science activities at the Science Museum of Minnesota (https://www.smm.org/darwin) as well as leading the Darwin Day celebrations at the First Unitarian Society of Minneapolis (http://firstunitarian.org/additional-sunday-programming/). Jonathan’s approach to Darwin Day reflects his passion of being a game designer and children’s author. My friends at The Howard Hughes Medical Institute (HHMI) BioInteractive group are providing two great treats for those interested in Darwin and evolution. First, the cleverly created the #12DaysOfDarwin hashtag on Twitter has been providing evolution-themed facts for folks to enjoy and share. Follow them at @BIOINTERACTIVE. More significantly, they are also offering a newly created 10-hour professional development course in evolution for teachers (http://www.hhmi.org/biointeractive/biointeractive-online-professional-learning-course-evolution). I’ve already signed up for it! It is well-designed and provides both depth and breadth of understanding for teachers at all levels. I am thankful to HHMI for such a “birthday” gift! Cornell University and the Paleontological Research Institution in Ithaca, New York, are expanding the idea of Darwin DAY and are celebrating a week of Darwin DAYS! From Sunday, February 11 through Saturday, February 17, they have events of all sorts scheduled throughout Ithaca to appeal to a range of ages and scientific disciplines. I confess to being disappointed that I am going to miss the keynote speech by Dr. Phoebe Cohen (@PhoebeFossil), “Evolution of Life Before Animals: Gasping for Breath and Dodging Snowballs.” Check out their week of events at http://priweb.org/index.php/events/at-the-museum/darwin-days/events-ddays-schedule. If you have a university nearby or live in a large town or city there is a good chance that someone is celebrating Darwin Day near you. The Darwin Day website, http://darwinday.org/ has a listing of events all over the world for you to explore! You can also get to know Darwin better by visiting the amazing online collection of Darwin’s papers at the American Museum of Natural History’s Darwin Manuscript Project. If you feel like reenacting some of Darwin’s experiments in your area I STRONGLY recommend you read the book Darwin’s Backyard: How Small Experiments Led to a Big Theory by James Costa. If you have middle-school-aged students and wish to introduce them to Darwin and his adventures, I recommend Darwin and Evolution for Kids: His Life and Ideas with 21 Activities by Kristan Lawson. Enjoy your Darwin Day and please let us know how you celebrated it by leaving a comment below! In Talking Evolution, teacher and science communicator John Mead brings evolution and biogeography “down to earth” with practical ideas for classrooms and learning networks.